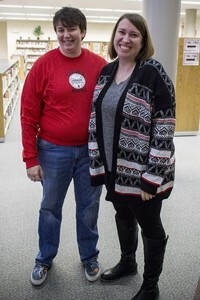 Laura Schwinn, a journalism teacher at Emporia High School, has been selected as the 2017 Emporia Master Teacher, according to an announcement today at EHS. Kristin Oberle, EMS art teacher and a past Emporia Master Teacher, presented the award today during a faculty breakfast. Schwinn, a graduate of Emporia High School, has been a member of the faculty since 2003. She has taught language arts and journalism, and in the past four years her classes have shifted to a Career and Technical Education pathway focusing on 21st Century Media, video and photography. She also is the EHS Echo online newspaper adviser and the Re-Echo yearbook adviser. The Emporia Master Teacher Award is presented each year by the Emporia NEA, and the honoree becomes the Emporia nominee for the Kansas Master Teacher Award. Schwinn has a bachelor’s degree in education and an English as a Second Language endorsement from Kansas State University. She taught one year at Marysville Junior/Senior High School before returning to EHS to teach. Established in 1953, the Master Teacher Awards are presented annually to teachers who have served the profession well and who typify the good qualities of earnest and conscientious teachers. Candidates for the awards are typically nominated by local teacher associations and school faculties. Selection of seven award recipients is made by a committee in the spring.